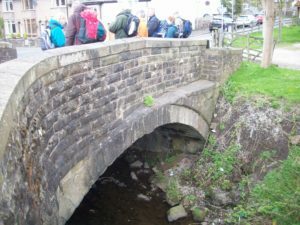 After parking on Clitheroe Road the group walked along the track towards the Craggs Farms until it met the junction with the King’s Highway. The group walked down King’s Highway into Heyhouses. 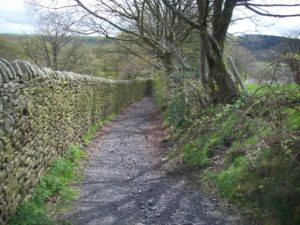 The road was followed to Sabden Bridge. 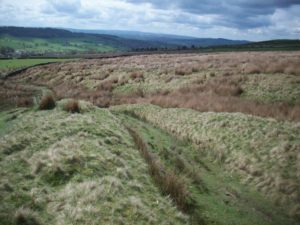 The walk looked at tracks, roads and field systems which could be part of the vaccary at the Craggs. The last section of road is bounded by a bank on one side and a high wall on the other. 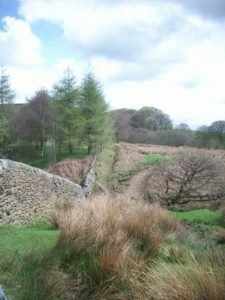 The wall is later in date to the walls higher up which form field boundaries, probably dating from the 1600s. The road at this point has been resurfaced for use as a bridleway. Bull Bridge, Sabden It is likely that there has been some sort of bridge or river crossing around this point from an early date. Documentary sources mention a bridge in 1425/4. The name of the bridge could also suggest a link to its use by the vaccary. Bank at side of King’s Highway is still visible, Paling – bank with fence on top topped with Hawthorne in places Potential vaccary winter pasture surrounded by bank with fence on top. This area would benefit from further survey work. The old barn at Cockshutts Farm was found to be very interesting. It has large opposing doors in the style of a threshing barn. The barn has been modified and added to over a long period. The return route took in the sights of industrial Sabden. After looking at the site of the toll house on Whalley Road, the group turned right on Whin’s Lane past Whin’s House. Remains of cotton mills (Watt Street) Cobbled track above Whin’s House. We then followed the track to Parsley Barn before returning to Clitheroe Road. 3 Paling – Middle English word dating back to 1350-1400 to enclose with pales, fence.